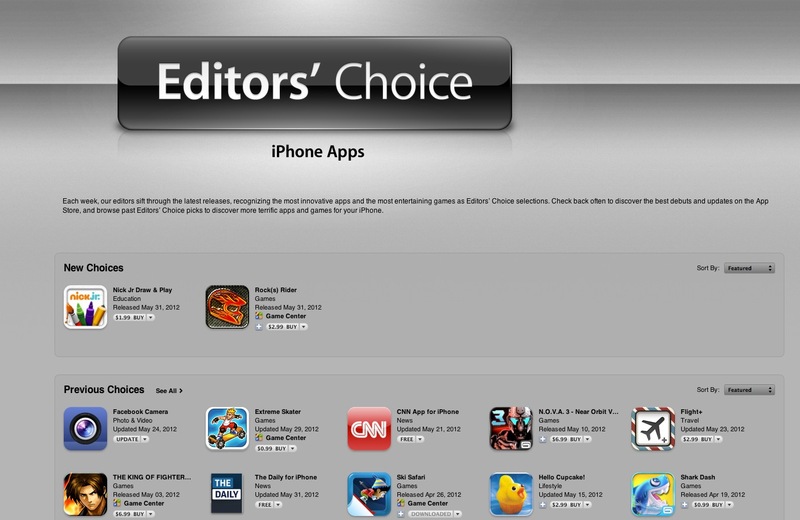 Last week Apple replaced the many of the ‘App of the X’ promotions that it had running on the App Store with an ‘Editor’s Choice’ banner. Now it has expanded the banner into a dedicated section for innovative apps and entertaining games, reports Macrumors. The section is populated with two sections, one showing ‘new’ choices that have been made and one showing past apps featured in the section. Apple says that the section is compiled by “recognizing the most innovative apps and the most entertaining games as Editor’s Choice selections.” It indicates that users should check back to discover recently debuted apps and past choices. Presumably, this is being done so that Apple has more flexibility with when it announces these featured apps and how long it leaves them up. It also makes it clear that the choices are being made by the iTunes editorial team. Yes, there is one and yes, they choose most of these apps. Apple has also recently started promoting an ‘App of the Week’ each week that is offered free of charge. It’s not clear whether these apps are voluntarily lowering their costs to free in order to be featured or if they’re being compensated for it by Apple. You can see the new Editor’s Choice section here. This week’s free app is Snapseed, an excellent iOS photo editor.